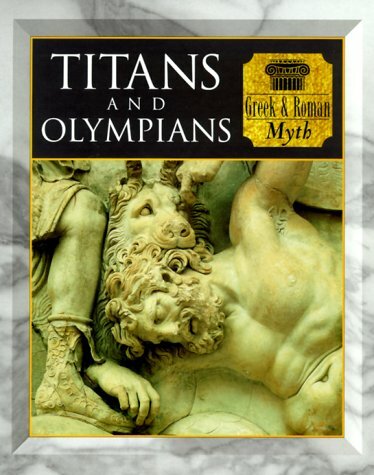 I have been studying Greek Mythology for many years and I am always looking for new books on the subject. I found this book to be very informative and accurate. It is also very easy to follow for those just learning about the subject. 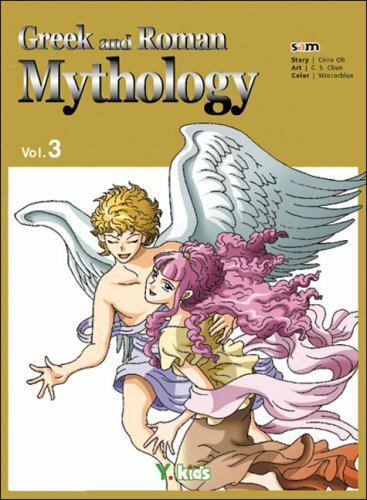 Also it was great that it has many of the new updates about Greek Mythology. New facts that have recently been discovered were included in this book. 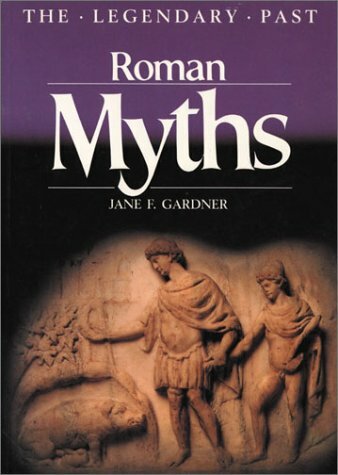 I think this is a must have book for long time Mythology fans as well as beginners. The genealogy trees are very enlightening to the understanding of the myths (there are big wide ones and small ones in each chapter), the pictures of related art are high quality and beautifuly printed, and the characters are insightfully described even though not that deeply. 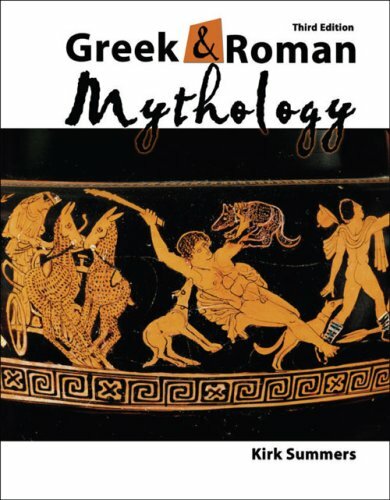 With one or two pages for each character, the author was able to provide a basic yet fulfilling understanding of the greek divinities and their roman equivalents. Still, the book has a few errors like mispells and one or another graphic inconsistencies, but I didn't mind. The paintings and genealogy trees are awesome! 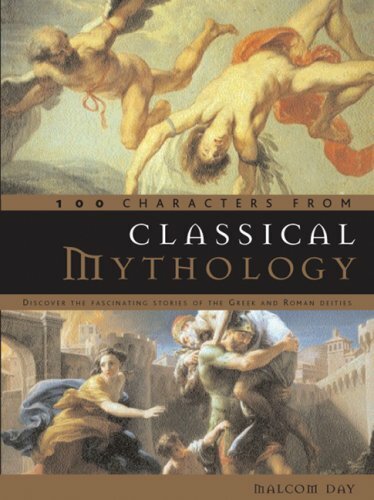 This work is an excellent introduction to the basic stories of classical, especially Greek, mythology. The artwork is amazing, and the author includes a geneaology chart on every page. Each character is described regarding his or her (or its) major mythological stories and theological concerns (things the figure is "god of"). This is only meant to be an introduction, a concise reference. In this respect, it exceeds amazingly. As the book carries on, Day often leaves much of his geneaologies to be assumed, and in this sense they are not always best for reference. The book lacks a quailty introduction, which should more thoroughly elucidate the religious culture of the ancient world (which is reference within the work, assuming that the reader is familiar with sacrifice and cult worship). 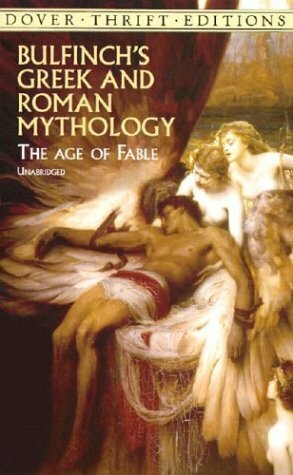 I found Roman Mythology entertaining and both clear and easy to understand. 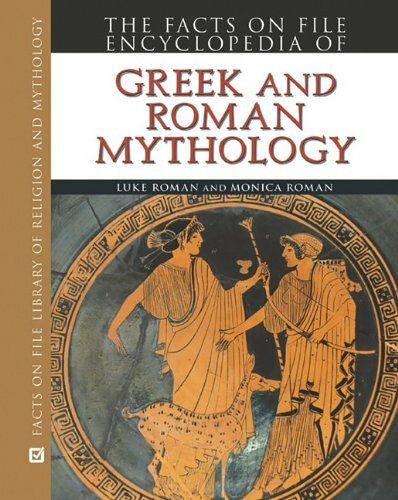 This book not only covers much of Roman Mythology - it excellently shows how Roman history, culture and Greek Mythology contributed to the development of the mythology. The additional expert comments at the end of each chapter add depth and insight into the subject of the chapter. 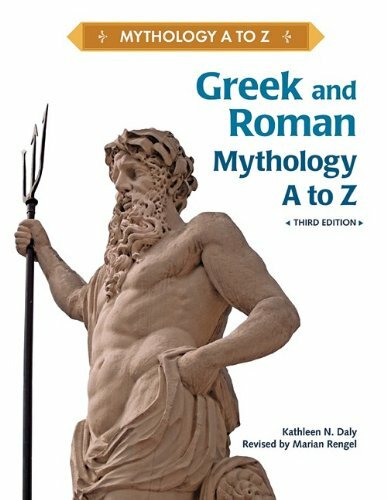 The book Greek and Roman Mythoglogy A-Z by Kathleen N. Daly is an excellent account of Greek and Roman culture. It is updated to recent facts and contains perpetuate amounts of self-reference to its own chapters. Its easy to find information is key to any myhtology lover or student looking for reference. This books good aspects outshine its bad. This book is an extraodinary supporter in preparing a reprt for ancient Hellenistic cultures. 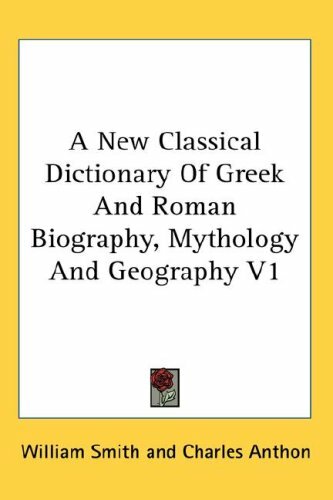 It not only contains the names of hundreds of Greek and Roman gods and goddesses, it has accounts of the societies peoples and writings of eternal scholars and authors and their lifetimes. Also the Geographic features of both civilizations. Even more, it is not just one bias view of a story, but also refers to other's perspectives of the fables. Vivid, classic retellings of the myths of Greece and Rome, along with stories of the Norse gods and heroes. Zeus and Hera, Apollo, Jason and the golden fleece, the wanderings of Ulysses and Aeneas, thedeeds of Thor, many more seminal stories underlying Western culture. My 10 year old son loved reading this. It helped with everything that he's studying in school. I bought this book based on the other reviews and its low price tag, but was very disappointed. Unless you are very into poetry, I do not believe you will enjoy this book. Somehow, it manages to make exciting myths boring. I would go with Hamilton's mythology book. While I have not finished reading this book yet, I am throughly enjoying it.I have wanted to read this book since before I could read (my mother had a copy with an interesting looking cover).Then when I learned to read it was too complicated.Now that I am grown (not according to my wife) it is nice to read and understand the book! 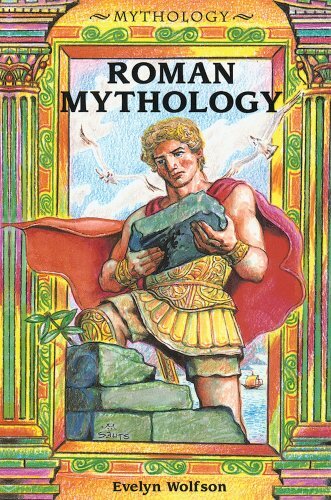 Long time favorite; good place to start for novice interested in mythology; always good for a reference book to refresh your memory. I gave this book as a gift to a family that reads books aloud every night. The children are ages 8 and 10. The parents are educators. The family went through the book in 2 weeks and the parents have reported the book is "fantastic" The 8 year old has been retelling the myths to me daily!I highly recommend this book. This is a marvelous book! I wanted my granddaughters to learn Greek and Roman myths since there are so many references to the stories and the characters in day-to-day media. If they knew more about the tales, I thought they could appreciate the references to them. I first looked at the book to find out if the girls would like it and get anything out of it. As it turned out, I read it from cover to cover, and couldn't put it down. I had never had school or college classes in these subjects and I was mesmerized. The plots are summarized at the beginning, which makes the stories easier to understand for people who have no knowledge at all of them. Also at the beginning of each myth is the amount of time it will take to read it -- making bedtime story reading more predictable. And, there is also a pronunciation guide for the names and some of the words, with brief explanations or definitions. The stories themselves are fascinating, easy to read aloud, print on the pages is clear and not too small, and chapters are of reasonable length to tell a tale and maintain interest. After the end of each, there are short descriptions of words we use in modern times which originated from these myths and the language and culture of ancient times. These can be eye-openers, and have given my granddaughters and I opportunities for many discussions! This was planned as a learning book. And, it's been a great teacher -- for the reader as well as the listeners! I have a 4 and 7 yr. old.The stories are above the 4 yr. old's head (though he does play mostly quietly and seem to somewhat listen, which can't be bad...I'd probably be surprised at how much he is learning from his seeming inattentiveness), but have been WONDERFUL for reading to my 7 yr. old.We started out with some other Mythology books from the library (including The McElderry Book of Greek Myths, which I highly reccomend for the illustrations), and we had also just been listening on a car trip to "The Story of the World: History For the Classical Child Volume 1" on CD (also highly reccomend...not as boring as it may sound) which on discs 3 & 4 recounted some Greek history and stories, at an age appropriate level.This was a wonderful precurser to our nightly readings from this book.That said, I am homeschooling my son, and all that is not necessary to enjoy this book on its own as simply some great stories to read.The stories are easier to get through than even some illustrated versions, as they are well written and broken into managably short chunks. My son looks forward to the stories, and is always begging me to read one more.At the beginning of each story, context is given, approximate reading times (most about 10 minutes), helpful pronunciation guides (that also remind you who the primary characters in the story are), and then at the end of each story "A few words more" that tells about words and idioms in our language that came from something related to the story (my son loves the connections he discovers...a great way to begin an awareness of roots of words.) Children can understand and relate to the emotion that is portrayed in the stories, while picking up new vocabulary and elegant speech painlessly from the context.This book does an excellent job of presenting the stories in a compelling, easy to understand, but not dumbed-down manner, that maintains the richness of the stories and enhances them with added context.I found the author's ability to illuminate the human emotion in the stories, highlighted when I read his version of Pygmalion and Galatea, which we had read other versions of.In other versions, Pygmalion came across far-fetched in his love for his statue creation, a seemingly silly fable, but in this version you feel the depths of Pygmalion's emotions, and come away feeling that there is much in the common human condition expressed in this story... the themes are brought out and the story becomes more meaningful. This is a book I plan to purchase, as it is not one we will outgrow and likely return to and enjoy often.We are on our third time checking it out from the library...and I really don't want to give it back.There are many books I love, that I am just fine borrowing from the library, but this one I really feel is worth the investment to have around as a staple in our home. 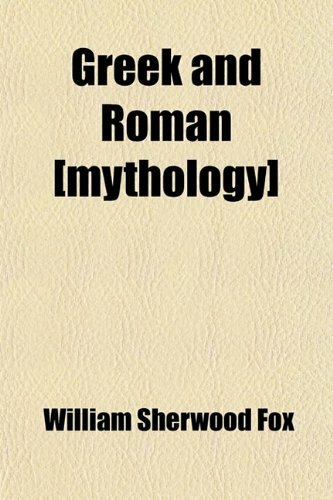 I've always had an interest in Greek and Roman mythology.So when I saw this on Amazon, I had to get it. Maybe I just didn't read all the fine print.And since no one had reviewed it...it was a gamble for me. So I thought I'd help out those who had my same idea. When they say encyclopedia, I think of Britannica, with all the pictures and information behind each article, being the visual person I am.But this "encyclopedia" is nonsense.It looks like just a bunch of newspaper articles.A very BORING "encyclopedia. "I returned it right away. 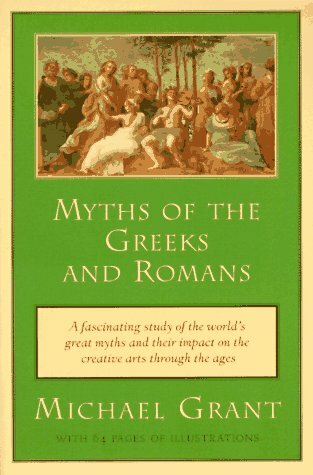 I bought this book while searching for a summary of up-to-date points of view on the Greek myths, but "Myths of the Greeks and Romans", first published in 1962, is no such thing. (Note that although the listing here says that this edition is "revised and updated", according to the title page only the bibliography has been updated.) It sorely feels the lack of half a century of archaeological and historical research, and of theoretical and literary perspectives. This is a pity, because the conception of the book, as a way of organizing the vastness of its material, is a good one: choose a number of ancient literary sources, summarize a myth or myth-cycle taken from each one, and discuss the history, background, alternate versions, and continuing literary legacy of that myth. Grant finds opportunities at various points in these discussions to introduce the layperson to an array of the theories that had been applied to myth by the mid-twentieth century: the aetiological, the ethnological, the psychoanalytic, the search for traces of history, various poetic theories, and so forth. (Incidentally, the book entirely omits footnotes for the scholars and works mentioned, and most of them are not even in the bibliography; though I realize that this is a conscious decision to avoid intimidating lay readers, I think it's a poor one.) Grant's eminently sensible insistence that "no single theory, however valuably suggestive, will suffice to explain the whole range of Greek and Roman mythology, or even a major proportion of its content" leads to some good passages, such as the section of the chapter on Demeter where his discussion of the relation between ritual and myth presents arguments for the primacy of the one and the other and points out that it's not necessary to choose between them. I also was impressed by his discussion of tragedy, from "Agamemnon" to the "Bacchae". Nonetheless, in a number of chapters, he doesn't quite succeed in subsuming the work of other scholars into a well-constructed, comprehensible organization. Furthermore, his summaries of literary works are written with mediocre style themselves, and his work is full of a certain mid-century stodginess; his praises of the universal qualities of the myths come from a cultural perspective just different enough from mine to make it obvious that he's mistaken in what he thinks is universal. Perhaps no suitable replacement for this good, but far from perfect, book has yet been written; but I hope it has. As important as almost any literature is in understanding Western culture are the tales of Greek and Roman mythology.Unlike Shakespeare, Chaucer or Cervantes, however, these stories are not identified with a single author, but rather a number of big names, including Sophocles, Aeschylus, Euripides, Livy, Ovid and most notably (and perhaps most legendary), Homer.These stories have endured for millennia, and have been related by a number of authors over the years.Michael Grant is walking over familiar ground with his book on these myths, but he still is able to provide a new look at these old stories. 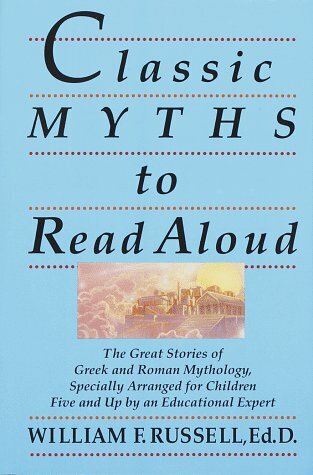 Grant, an author on numerous books on ancient history (particularly Greek and Roman, but also other Mediterranean communities), definitely has the credentials to write about these stories.The myths themselves are actually just the starting point in his discussion; what follows after the tales is an analysis of the impact of the story. An example would be the story of Oedipus, in particular, Sophocles play, King Oedipus (also known as Oedipus Rex).First Grant tells the story in a rather straightforward narrative with occasional interruptions where he provides excerpts from translations.He then discusses some of the history behind Oedipus and some of the thematic issues:for example, why is Oedipus punished for a fate beyond his control?Grant also discusses Freud and the Oedipus Complex. What's important to Grant is that these myths are not mere entertainments, but instead have a depths and breadth that goes well beyond the actual tale.All the well-known tales are discussed:the Iliad and the Odyssey, Jason and the Argonauts, Perseus, Aeneas, Romulus and Remus, and many others.What is sad is the amount of material that has been lost to the ages, such as most of the plays of Sophocles and Aeschylus, or the lost parts of the grand Trojan War epic of which the Iliad and Odyssey were only a part. While Grant can sometimes be a little tedious in his histories, he is in top form with this book.I would not recommend this book as an introduction to these myths (as storytelling is not Grant's primary objective), but if you know them already, this book is great:it'll give you a fresh, insightful look into these classic stories. One of the most useful parts of the set is the final volume, an extremely detailed index, which allows the reader to pursue a theme, or even a topic as specific as the significance of belts, across all the volumes.The individual volumes do not have their own indices, but the tables of contents are fairly detailed.The books appear to have been issued without dust jackets. Integrates mythology, geography, creative writing, and storytellingthrough mythological stories, maps, charts, and worksheets. Zeus, Medusa, Hercules, Aphrodite. Did you know that these and other dynamic deities, heroes, and monsters of Greek and Roman mythology live on in the names of trees and flowers? Some grow in your local woodlands or right in your own backyard garden. In this delightful book, botanist Peter Bernhardt reveals the rich history and mythology that underlie the origins of many scientific plant names. Unlike other books about botanical taxonomy that take the form of heavy and intimidating lexicons, Bernhardt's account comes together in a series of interlocking stories. 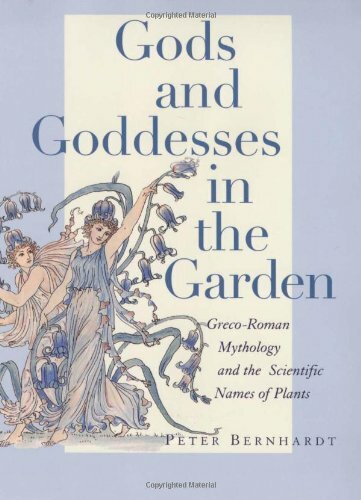 Each chapter opens with a short version of a classical myth, then links the tale to plant names, showing how each plant "resembles" its mythological counterpart with regard to its history, anatomy, life cycle, and conservation. You will learn, for example, that as our garden acanthus wears nasty spines along its leaf margins, it is named for the nymph who scratched the face of Apollo. The shape-shifting god, Proteus, gives his name to a whole family of shrubs and trees that produce colorful flowering branches in an astonishing number of sizes and shapes. 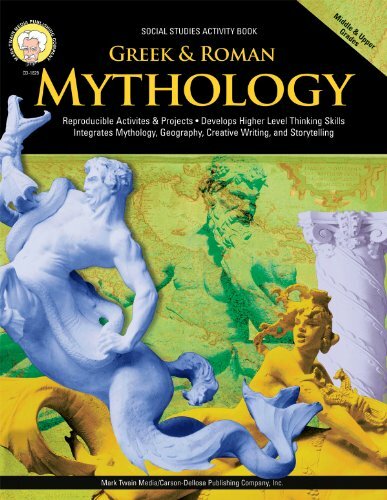 I wanted a book that gave an overview of Greek and Roman mythology. and also provided lists of various gods and their counterparts, i.e., the Greek god is ------ and the counterpart Roman god is ------. This book gives me what I wanted. There are no pictures in this book so it's not much fun.The illustrations that are in the book are bad drawings of ancient sculptures.I'm returning it. 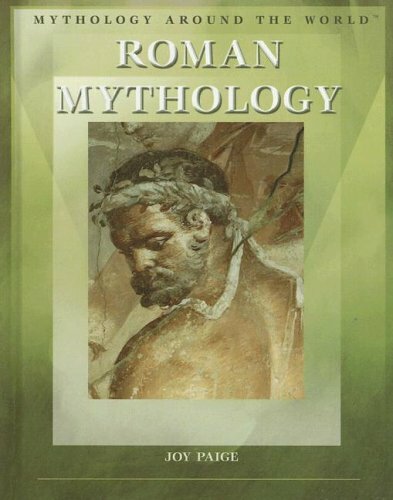 While this reference is quite basic, it is easy to follow the lineage and obtain a working knowledge of classical mythology from this book.HOWEVER, beware that there are several misprints that will confuse the reader, as well as references in the index to characters that do not appear on the mentioned page.Thus, the book is in dire need of a decent editor. 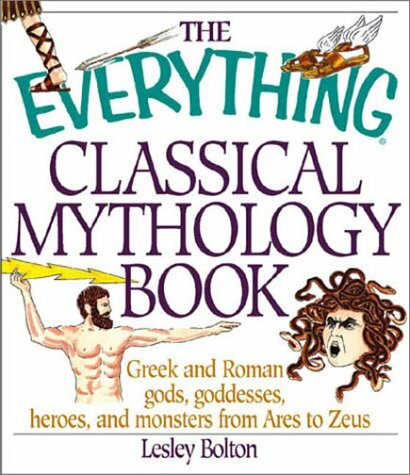 This "Everything" guide is a good book for younger readers and those who are only starting to get into mythology.At over 290 pages, it covers the major players and who's who of Roman and Greek mythology (as in Jupiter/Zeus, Venus/Aphrodite, the Trojan War, Odysseus, et al). However, more serious and 'seasoned' fans and scholars will likely prefer THE COMPLETE IDIOT'S GUIDE TO CLASSICAL MYTHOLOGY by Kevin Osborn.We're not idiots, of course, but this book is meatier and has more background information on the various gods/goddesses, heroes and stories. At over 350 pages, it is 60 pages thicker than the "Everything" book and has smaller text and less white space.For instance, an entire chapter is devoted to the Trojan War hero Achilles while the "Everything" book only has a few pages, at the most. Fans who want more than classical mythology will want to explore MYTHOLOGY FOR DUMMIES by Christopher Blackwell.This book also delves into the Arthurian legend, Norse myths, Beowulf, as well as world mythology in general (Chinese, Jewish, Hindu, etc). From the same series as Abrams’ successful Saints and Angels comes Myths, richly illustrated with representations of these celestial heralds from ancient murals and pottery to the paintings of Gustav Klimt and Odilon Redon. Author Lucia Impelluso has drawn from a variety of sources, including the plays of Euripides and Aeschylus, the epics of Homer and Virgil, Aesop’s fables, Ovid’s Metamorphoses, Petrarch’s sonnets, and the works of Pindar, Sophocles, Plutarch, Pliny the Elder, and Bocaccio. 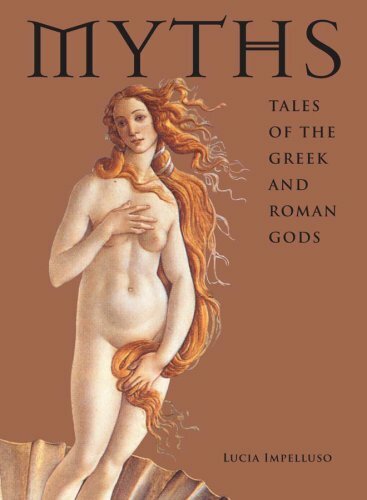 Beginning with the stories of Earth’s creation and its early rulers, the Titans, Impelluso recounts the major episodes and figures of Greek and Roman mythology, with sections on the gods of the sky, the sea, the earth, and the underworld; the Fates and the Muses; monsters; human heroes; and the Iliad, the Odyssey, and the Aeneid. Here are beloved stories, retold and illustrated in a wonderful, giftable format. When you first pick up this little book, you will more than likely be shocked at how heavy it feels. But, a quick glance through the book will show you why. Jam-packed with hundreds of beautiful images and a small story accompanying each, this book tracks the mythology starting from the Earth's creation all the way to the legendary Trojan War. From ancient murals, classic sculptures, and works from some greatest Western artists - like Da Vinci, Michaelangelo, and Gustav Klimt - accompanied by great literature works, such as the Odyssey and the Aeneid, Impelluso does a wonderful job at bringing all of the classic stories of monsters, gods, and heroes together in a vibrant and rich book. This book serves very well as a translation and commentary for the Catasterismi of Pseudo-Eratosthenes and the Poeticon Astronomicon of Hyginus.I would recommend this book to the scholar and archeoastronomer. So, yes, this is a recommendable book, but keep in mind that Condos' translation was made through referencing ancient texts alone without a proper study of the actual sky and stars upon which the texts were based.This flaw isn't fatal, but it is significant enough for me to dock one star and recommend that the reader have an atlas of his or her own to reference when using this book. Star Myths is an excellent sourcebook - for a serious student. If you're looking for entertaining and engaging writing, look elsewhere. 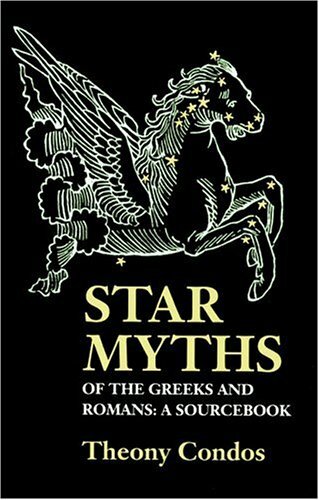 If you want a learned (if brief) overview of how the Greek and Roman constellations were named, by whom, and what stars are contained therein, then you've got the right volume! Theony Condos, the translator, draws mostly on two prime sources; Poeticon Astronomicon (Poetic Astronomy), attributed to Hyginus; and Catasterismi (The Constellations), by Eratothenes. In the introduction, Condos discusses the backgrounds of Hyginus and Eratothenes, their influences and sources, and some supporting and relating works by their contemporaries and historical peers. Moving on from the (mercifully!) brief introduction, Condos procedes directly to the heart of the matter, and launches into an alphebetized listing of the major 'western' constellations, each with a idealized line-drawing of the constellation and its namesake image, a brief discussion of the associated legend(s) as discussed in the primary works, and a translators commentary. Primary stars, where possible, are indicated by their symbols (rather than spelling out their names) in the text. This last I found most frustrating, for while a serious scholar of Latin and Greek would recognize these symbols immediately, I found myself struggling to interpret them. This book comes with fairly extensive end notes and appendicies, useful to the student looking for more insight. While I find this volume to be useful in a limited way, it's really aimed towards the more serious student, and not to the casual sky-watcher. If you want an education on the origins of the Western European constellations, this is a good place to start, though it's not the ultimate word on the subject. However, if you want to identify that intriguing cluster of bright lights in the nighttime sky, you'll probably want to go elsewhere.